Medals currently not in hand, but bill of sale received via email confirming my purchase (with a reputable dealer). NGC certification numbers were provided prior to sale for authentication and visual inspection (I really like the NGC Coin Details phone app). I decided not to share those images at this time, however I did create a NGC Custom set (currently set to private). The big reveal still to occur when medals in hand….. Lets see how many of you are paying attention and reading my blog. Here is a freebie. And it’s still available. RHM database incorrectly state bronze mintage of 500. RHM website indicates bronze mintage of 50. RHM database collaborates with the mintage of 50 since the same medal in silver has a mintage of 30…. The mintage or 50 and 30 is reasonable, while the mintage of 500 and 30 is off. Besides, the RHM website states its a limited mintage (term not used with strikings of 500). The design is a modern replication of 2TE-1 (John T. Waterhouse early token). Currently, only two GOLD errors are known (serial # 2023 and #2119). Check your coins and let me know what you find…The serial # is on the COA and not on the coin. Serial # 2119 was first sold on eBay back in 2011. I recently purchased Serial #2119 in September 2014. Serial #2023. I also recently acquired Serial 2023 in September 2014. 59, 580, 993, 1073, 1232, and 5044. 5044? Yes, I checked the serial# of a coin already in my collection. I also have another without COA. The coin without a COA is in a different capsule. The question now. 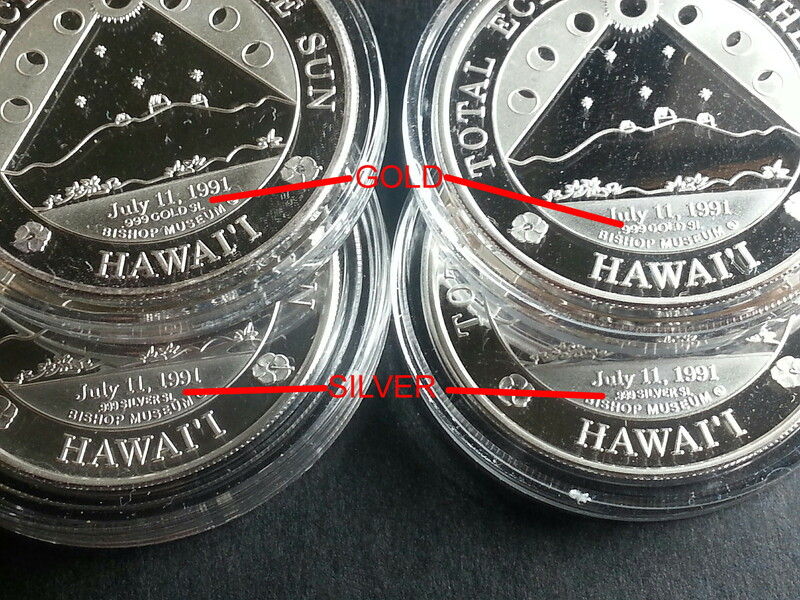 Did The Honolulu Mint catch the error and only let a few slip into their inventory or did they strike coins for the life of the die? Based on my findings I say that they caught the error and had a few slipped into their inventory. I located 18 sales of the SILVER variety and only 3 sales of the GOLD variety (counting the two sales of serial #2119). Images of the four coins in my collection. I’m delinquent in adding the results to this blog. 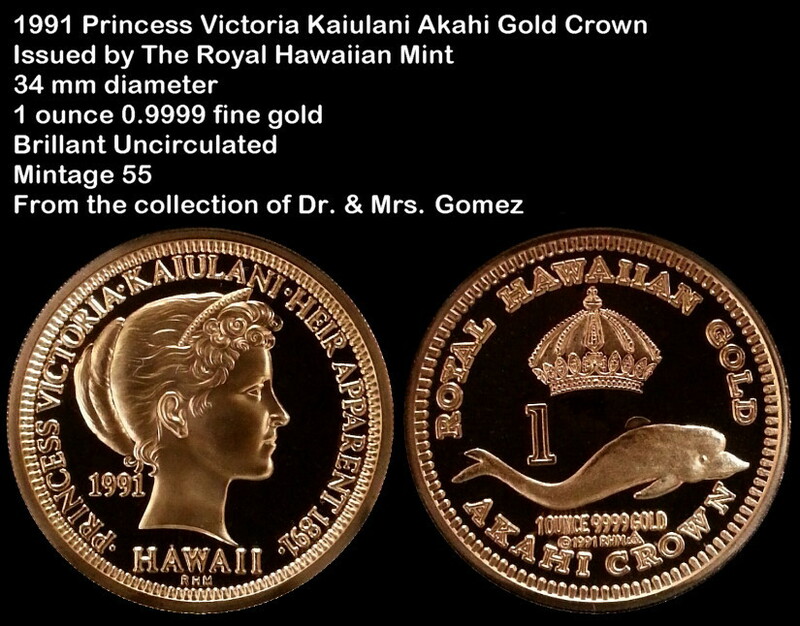 I still stand by the Princess Kaiulani design by the Royal Hawaiian Mint as my “it” coin. Yes, that is my contact e-mail address published at this blog. Here is my “it” coin with a mintage of 55. 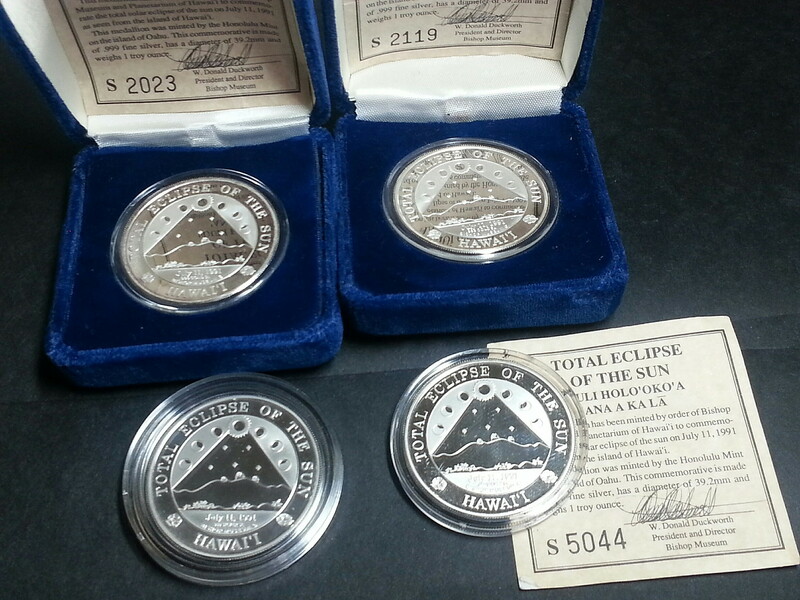 My second choice (I had to publish a book about it)..
As I reported on my September 12, 2014 blog, the Royal Hawaiian Mint is back online selling previous inventory and new inventory. I noticed today that on my watch list a few items have sold out (i.e. 1989 HSNA Gold). My first order number is less than 10 and its still being processed. Today’s coin of the day….. If you observe the obverse, it has no welt (should be by the lower dot). This is not a 1976 or 1977 struck copper coin (date of 1976 is reused until 1979). Key sign is no welt. Coin was struck in 1978 based on description match (first no welt occurence and no subsequent description match occurrence). (2) 100 mintage (62 originally issued + 38 never issued until now).